Pallas Kunaiyi-Akpanah reaches for a rebound. The senior forward had a double-double Sunday. For the first 10 minutes Sunday, Northwestern and Tennessee-Martin played a fairly even game, with the Wildcats holding an 18-14 advantage after the first quarter. But in the second quarter, NU showed its might and squashed the visiting Skyhawks, scoring 28 points in the quarter and holding a 20-point lead at halftime. Things evened out after the 15-minute intermission but the Cats (5-0) proved to be too much for UT-Martin (4-2) — who never held a lead during the game — as NU won 90-64. Despite scoring a season-high 90 points, the Cats did almost all of their damage from inside the arc. NU had 46 points in the paint and shot made 24 free throws. In addition, sophomore guard Lindsey Pulliam, the team’s leading scorer, struggled to make baskets. The Maryland native was only 3-for-15 from the field, including 1-for-10 in the first half, but still managed to score 12 points. Senior forward Pallas Kunaiyi-Akpanah accumulated her fourth double-double of the young season with 12 points and 16 rebounds — eight of them on the offensive glass — in only 22 minutes of action. Freshman guard Jess Sancataldo had a breakout game off the bench. With freshman guard Veronica Burton still on the mend and junior forward Abi Scheid in a walking boot following an injury acquired against Florida, the Australia native earned her most playing time of the season and took advantage. In 13 minutes, Sancataldo shot 80 percent from the floor and scored a game-high 20 points. While the team has struggled from beyond the arc to start the year, the team was particularly poor from distance Sunday. NU was only 2-for-9 from beyond the arc, with both three-point baskets coming in garbage time in the fourth quarter. For most of Sunday’s contest, UT-Martin used a full-court press to try and force the Cats into commiting turnovers. However, the press could not contain the NU ballhandlers. 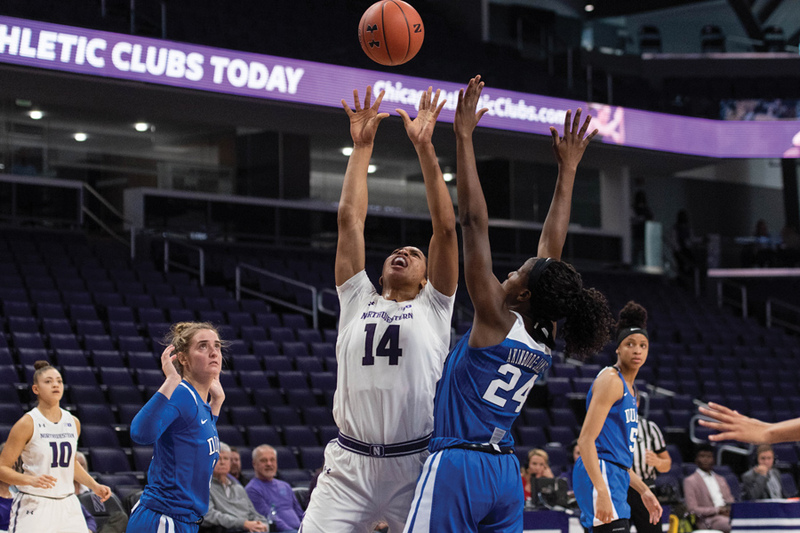 The press-breaker unit — led by junior guard Byrdy Galernik, sophomore guard Jordan Hamilton, and junior forward Bryana Hopkins — failed to be fazed. All three dribbled with confidence and many times found an open teammate upcourt, leading to an easy layup or a shooting foul. The Cats scored 31 points in fast-break situations and finished 22 of their 34 layup opportunities. Entering the game, the Skyhawks averaged 92.2 points per game and had finished below 89 points only once this campaign. But the NU defense stifled the UT-Martin offense to only 34.8 percent shooting from the field. A previous version of this story had an incorrect caption. The Daily regrets the error.